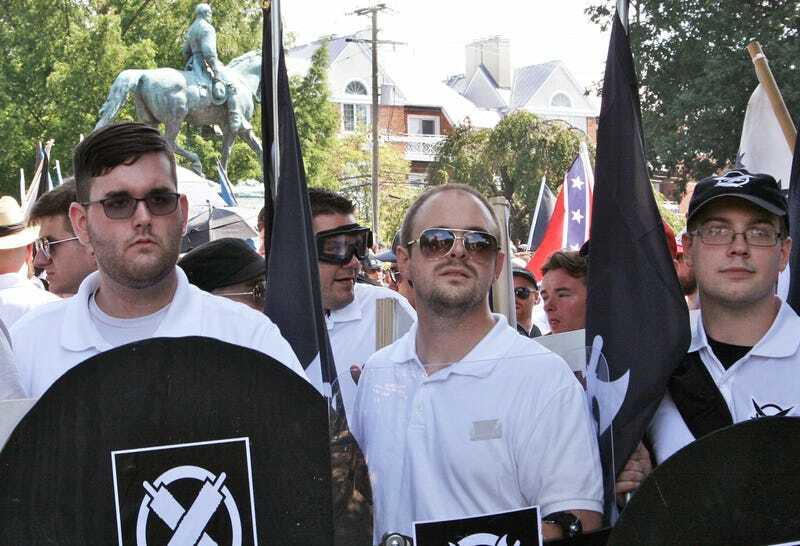 James Alex Fields (far left) at the Unite the Right Rally in Charlottesville on Aug. 12, 2017, before he murdered Heather Heyer by driving his car into a crowd of counterprotesters. A Virginia jury recommended a life sentence for James Alex Fields, the avowed neo-Nazi who killed Heather Heyer when he drove his car into a crowd of counter-protesters at the “Unite the Right” rally in Charlottesville, Va., last year. Fields was convicted of first-degree murder last Friday, along with nine more charges including malicious wounding and fleeing the scene of a crime. As WTOP reports, the jury recommended an additional 20 years on three counts of malicious wounding, nine years for the hit-and-run, and a $100,000 fine. The jury’s recommendation followed two days of emotional testimony from other victims of the Aug. 12 attack, including Heather Heyer’s mother, Susan Bro. Another of Fields’ victims, Jeanne “Star” Peterson, told the jury her life has been a “living nightmare” since Fields plowed his car into the crowd that day. Peterson suffered a broken spine as a result of the attack and hasn’t been able to return to work, she says. Her right leg was also shattered, requiring five surgeries so far to try to repair it. During the trial, Fields’ lawyer attempted to argue that, in driving his Dodge Challenger into the group of anti-white-supremacist counterprotesters, Fields was acting in “self-defense.” According to NPR, attorney John Hill said Fields was “scared to death” and feared bodily harm after some Unite the Right rallygoers and counterprotesters clashed. The jury didn’t buy it. With their recommendation, the decision to put Fields behind bars for the rest of his life now lies with a judge, who will impose a sentence on March 29. According to WTOP, Virginia judges will typically follow a jury’s recommendation and are prohibited from imposing stiffer sentences. In addition to his state conviction, Fields is awaiting trial for federal hate crime charges, which could warrant the death penalty, NPR reports. Trial Begins for White Supremacist Suspect in Deadly Charlottesville Car Attack. Can It Bring Justice?